Enter our "Free Rug Give Away worth £49.99" competition and win a chance to bring home this amazing Heart Shaped Pastel Pink Rug for your little princess. 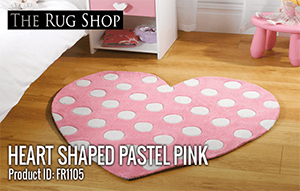 Win this Heart Shaped Pastel Pink Rug simply by posting a picture of your rug bought from us with your order number. One lucky winner will be announced on June 1st 2018 based on the random selection. We'll feature your post along with your facebook profile pic and your name on Rug Shop's homepage banner. All Entries should be made by or before Midnight 30th May. Please note, we can only accept one rug per post, if you have placed an order with us for more than one rug then each rug will have to posted independently. The winning post will receive Free Heart Shaped Pastel Pink Rug worth £49.99. Winner will be announced on 1st June.